Palm-leaf manuscripts are manuscripts made out of dried palm leaves. Palm leaves were used as writing materials in South Asia and in Southeast Asia dating back to the 5th century BCE, and possibly much earlier. Their use began in South Asia, and spread elsewhere, as texts on dried and smoke treated palm leaves of Borassus species (Palmyra palm) or the ola leaf (leaf of the Corypha umbraculifera or Talipot palm). Palm leaf manuscripts were written in ink on rectangular cut and cured palm leaf sheet. Each sheet typically had a hole through which a string could pass through, and with these the sheets were tied together with a string to bind like a book. A palm leaf text thus created had a limited time (between few decades to ~600 years) and the document had to be copied onto new sets of dried palm leaves as the document decayed due to dampness, insect activity, mold and fragility. 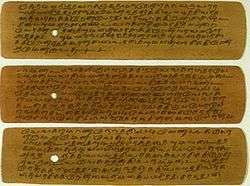 The oldest surviving palm leaf Indian manuscripts have been found in colder, drier climates such as in parts of Nepal, Tibet and central Asia, the source of 1st-millennium CE manuscripts. The individual sheets of palm leaves were called Patra or Parna in Sanskrit (Pali/Prakrit: Panna), and the medium when ready to write was called Tada-patra (or Tala-patra, Tali, Tadi). The famous 5th-century CE Indian manuscript called the Bower Manuscript discovered in Chinese Turkestan, was written on birch-bark sheets shaped in the form of treated palm leaves. John Guy and Jorrit Britschgi state Hindu temples served as centers where ancient manuscripts were routinely used for learning and where the texts were copied when they wore out. In South India, temples and associated mutts served custodial functions, and a large number of manuscripts on Hindu philosophy, poetry, grammar and other subjects were written, multiplied and preserved inside the temples. Archaeological and epigraphical evidence indicates existence of libraries called Sarasvati-bhandara, dated possibly to early 12th-century and employing librarians, attached to Hindu temples. Palm leaf manuscripts were also preserved inside Jain temples and in Buddhist monasteries. With the introduction of printing presses in the early 19th century, this cycle of copying from palm leaves came to an end. Many governments are making efforts to preserve what is left of their palm leaf documents. The rounded or diagonal shapes of the letters of many of the scripts of South India and Southeast Asia, such as Devanagari, Nandinagari, Telugu script, Lontara, the Javanese script, the Balinese alphabet, the Odia alphabet, the Burmese alphabet, the Tamil script and others may have developed as an adaptation to writing on palm leaves, as angular letters tend to split the leaf. 1 2 3 "Literature | The Story of India - Photo Gallery". PBS. Retrieved 2013-11-13. ↑ "Conservation and Digitisation of Rolled Palm Leaf Manuscripts in Nepal". Asianart.com. 2005-11-14. Retrieved 2013-11-13. ↑ "Digital Library of Lao Manuscripts". Laomanuscripts.net. Retrieved 2013-11-13. ↑ Nāgārjuna Siddha (2002). Conjugal Love in India: Ratiśāstra and Ratiramaṇa : Text, Translation, and Notes. BRILL. pp. 3–. ISBN 978-90-04-12598-8. Retrieved 28 March 2013. ↑ Zvelebil, Kamil (1973-01-01). The Smile of Murugan: On Tamil Literature of South India. BRILL. ISBN 9004035915. ↑ Interview: Digitalizing heritage for the coming generation. Bhasha India. Microsoft. Retrieved 17 January 2012.